An okay movie with a star-studded cast, that should have been a hell of a lot better. Here’s a movie that seems like it should be great, if it can just pull off a few simple things. And it doesn’t. There are three things a movie with this plot line, about executing an impossible heist, has to do. First, convince us, (and the characters,) that they should do the heist. Set it all up in a way that gets our interest and attention. Second, give us an exciting heist. And third, give us a follow through where the villains come after our heroes, and raise the stakes. 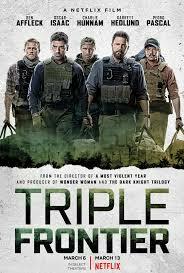 Triple Frontier does two of the three things. Everything through the heist itself is great. But then after it is done, this movie drops the ball. The drug kingpin’s men don’t even come after our guys. They get away scott-free. And yet they run into other problems, trying to get home, and that becomes the entire second half of the movie. It’s not what we are expecting, and maybe that’s the point. But when expectations are really high, you need to either match them or go higher. This movie chooses to do something smaller, (the only real threats in the second half come from villagers or teenagers,) just because it’s not what we would expect. It’s still an interesting film with a great setup, but the follow-through and payoff leave much to be desired. 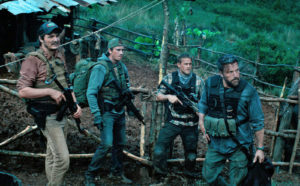 The appeal to this movie is that a bunch of former military operatives who are also longtime friends decide to now pull off a heist of the home of a drug kingpin, named Lorea, who keeps all his money with him inside the secret house, hidden in the middle of the jungle. It sounds interesting. We’ve seen plenty of heist movies before, but they’re usually about robbing banks or stores. Not drug dealers in the jungle. Between that and the cast, this one definitely seems like it has the formula for success. The problem is that the movie makes a some very obvious and critical mistakes. If you’re going to make s movie about robbing a drug dealer, and basically buying off more than you can chew, then there have to be ramifications for pulling off the robbery. Either something has to go horribly wrong during the robbery, or the bad guys have to find out who robbed them. And these villains most definitely have to spend the second half of the movie coming after our heroes (antiheroes, really.) Only none of that happens here. The robbery is great, but the second half doesn’t deliver on the setup, like we would hope. The reason that the stakes are so high in this movie is because the person they are robbing from, Lorea, is one of the most dangerous men in the world. Only we don’t really see that. We don’t spend much time with this character, who is supposedly our villain. But maybe there’s a reason for this. Maybe there’s a reason why the drug kingpin and his men and partners don’t come after the guys, seeking their money and vengeance. The movie wants us to take as our reason that nobody knows it was these guys who did it. But the reason why maybe the movie itself, doesn’t have a second half that is all about people coming after them, is because this one wants to be diffferent from what we’ve seen of this type of film before. It cares so much about being different, in fact, that it sacrifices the qualities that would have made this a much better film and more exciting film. Now, the second half is still filled with a number of challenges, even if they don’t come from the drug dealer or his people. And we’ll get to that a little later. But it’s safe to say the challenges that they do face aren’t nearly as exciting as they should have been. Especially considering the lengthy setup and how much this movie was preparing us, in the first half, for something big to follow. Even the robbery itself, which is the highlight of the film, feels a little too anti-climactic and simple. Where are the surprises? At the start of the movie, we meet Pope (Isaac,) the protagonist of the movie, who is doing some private military adviser work in Colombia. Pope meets a woman who wants desperately to get herself dnd her brother out of the country, and is willing to trade him information, in order to get this. The information is about the whereabouts of Lorea’s secret safe house, in the middle of the jungle. This woman, Yovanna, works for Lorea, and delivers drugs and money to his house. She is the inside player and will help with whatever Pope is planning and exchange for his help to get her and her brother out. And so Pope goes off to recruit his friends. These friends include Tom (Affleck,) Will (Hunnam,) Ben (Garett Hedlund from Tron Legacy,) and Francisco (Pedro Pascsl from Game of Thrones.) They slowly agree to the mission, one by one, and soon the whole group of them is headed out there to Colombia to check it out. First they surveil the house, and then they come up with a plan. This will involve getting another van into the property and raiding it while the family is out at Church. Only Lorea will be there, on the property, with a few of his men. And so the heist goes down. It’s a lot of fun with the guys finding two wrinkles in their plan. First, they can’t find the money anywhere. When they make it into the room where they are expecting to find cases or bags packed with money, they are shocked to find the room completely empty. And the place where the money is hidden turn out to be a fantastic surprise. Most definitely the coolest idea in the entire movie. And then, second, Lorea is nowhere to be found. He’s clearly in hiding somewhere around the house, and not knowing where becomes pretty scary. But both of these surprises or questions get resolved, and the guys make it off of the compound with jutting more then a slight hiccup. And now its just about getting home. Which turns out to be not very easy. The money they are transporting is so heavy that it weighs down the helicopter. The helicopter, then, can’t make it over the mountains. And so the guys have to unload. They drop some cargo, and when it lands on the property of some drug farmers, the guys go down there and have some conflict with these men. Some of the more aggressive farmers get killed. Our guys try to pay off the village elder to compensate for the loss, but it’s not enough. Some of the deceased’s family members come after our guys seeking vengeance and add new problems into their plan. At the end, our characters are being pursued by threats (these guys who followed them from the village, or a bunch of teenagers who have heard of the loot our group is carrying and has set out to take it from them.) But none of these threats are even close to what we thought we’d be getting in this movie. How can you compare the forces of a drug kingpin (or his partners) hellbent on seeking revenge, to a bunch of faceless teenagers who have merely heard of a possible opportunity and are out there on the beach in a car, checking it out? It’s opposite ends of the spectrum here. This movie should have had Lorea’s men taking out our guys one at a time, like in Things to Do In Denver When You’re Dead. Instead, what we have here is all setup and minimal to no payoff. Nobody from the drug cartel comes after them. That’s a problem. And yes, there are other issues that come their way, but none quite as serious or exciting as that would have been.